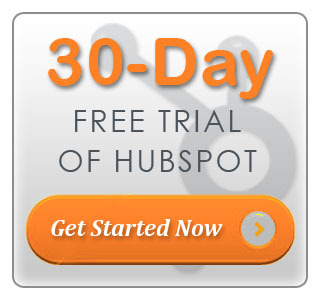 Try HubSpot's Automated Keyword Tool, Free! Find out how software can do top-notch keyword selection for you with HubSpot's free 30-day trial! Today, most business purchasers looking to buy a product or service start the process by using a search engine to find vendors and product information. How can you make sure that your business is found when these people are looking for you or your competitors? You need to make sure you rank high in the search engine results, for as many search terms as possible, and hopefully for many of the terms that are searched for more frequently. The first step toward ranking high in the results for the most common terms that people search for is to have the right keywords as part of your online presence. You have to get on the first or second page of search results. If you are not on the first or second page of search results, it is almost like not being there at all. Shorter search phrases are searched for more often. Usually more searches occur for marketing than for online marketing and both of those terms are searched more frequently than small business online marketing. It is usually more difficult to get ranked on the first or second page for popular searches. Because people know that marketing is searched more often than small business marketing, more people are trying to get onto the results for marketing and it is usually more difficult to get highly ranked for the more frequently searched term. 1) Create a keyword list. Start by thinking about the 3-5 words that you think people will search on to find your business or businesses like yours. Then use keyword tools to understand how often people search on the terms related to your business. I used the keywords marketing, lead, and small business for this example. Here are two tools that allow you to enter one word (like marketing) and get a list of related search terms as well as the number of times people search for each term. Googles Keyword Tool is a little bit different because it does not give you the total number of searches, it just tells you if the search activity is low or high on a 1 to 5 scale. But, it has another useful tool that allows you to put in your website (or a competitors website) and then it will analyze the site and spit out keywords that are related to the site. This part of the tool is useful if you dont really know where to start on finding keywords. 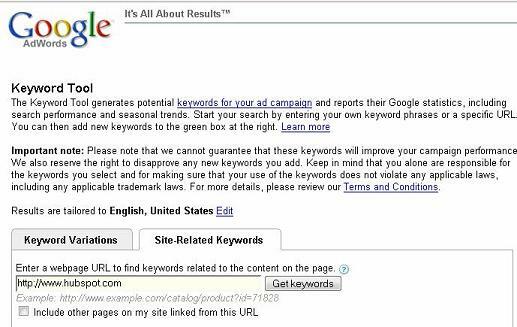 Google Keyword Tool allows you to find keywords related to your website or a competitors web site. 2) Combine and analyze the results. Score each term on relevance to your business. Go through each row of the spreadsheet and score each search term on how relevant to your business it is in a new column called Relevance. I like to use a 1 to 5 scale, with 5 being the most relevant for my business. For example, I would give the term small business internet marketing a score of 5, while just the term marketing would probably get a 3 score, and the terms lead crystal, lead singer and lead acid should all get scored as a 1. These are all related to the word spelled l-e-a-d, but are not related to the word lead as I mean it, which is as a sales or marketing lead. The way I like to think about this is for the people searching on that term you are scoring, how likely is it that they will convert to a customer when they visit your website. A score of 1 means your business is not relevant to the person searching, a score of 5 means it is the perfect business for them. Score the terms by the number of searches. Create another column called Volume. In this column, we will score each term by the number of searches. Use the sorting functionality in Excel to sort the search terms from the largest number of searches at the top to the lowest number. Create another column called Volume. Now, in this volume column, we will score each term by the number of searches. For example, if your list contains 300 search terms, the top 60 in terms of number of searches would get a score of 5. The next 60 terms get a score of 4, continuing until the last 60 terms get a score of 1. Find the best search keywords. What we are looking for are terms that get a lot of searches and are very relevant to your business. For instance, small business online marketing is a very targeted term for our business, but it gets fewer searches than just marketing. Using the two scores we now have, we can create a column that gives a total of the relevance score and the volume score. Create a final column called Total Score and have it be equal to the sum of twice the relevance score plus the volume score. (You want to double the relevance score since it is more important than the volume score because there is usually a lot of competition for the high volume keywords and it is not worth going after unless they are very relevant to your business.) Now sort by this column to give you the terms at the top of your list that have the highest combination of search volume and relevance. In the image below you can see what terms became the ones I should focus on for my example. Often the most relevant terms have the highest volume, but there are usually some interesting findings as well. For instance, for me the terms contemporary marketing, search engine marketing company and sale lead all got a 3 for a volume score, but because of their high relevance, they are in my top 30 search phrases to focus on. 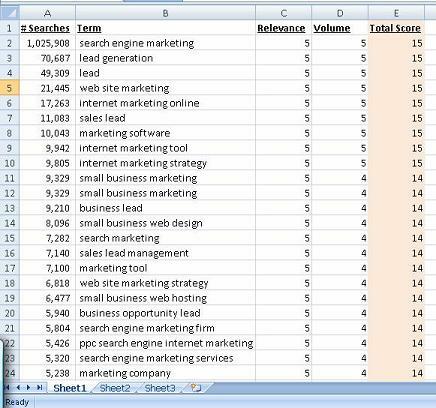 A list of search terms scored for volume and relevance and sorted by a total score. 3) Pick your keywords and use them on your website. You really want to boil it down to a list of the 3-5 most important individual words, and then a list of the top keywords and phrases that you will use on your website. I usually like to focus on the top 30 terms from the spreadsheet. You should use the keywords in the page titles, URLs, meta data, and the text on the page itself. Want a tool that does all of this automatically? Request a demo of HubSpot and find out how software can do all of this for you!